This is the simplest stringed instrument one could possibly make and play. It is one string!!! It consists of a 3/4” square piece of hardwood approximately 27” long, one length of .012 gauge steel wire, a tuning mechanism ( I used a guitar tuner) and a can. 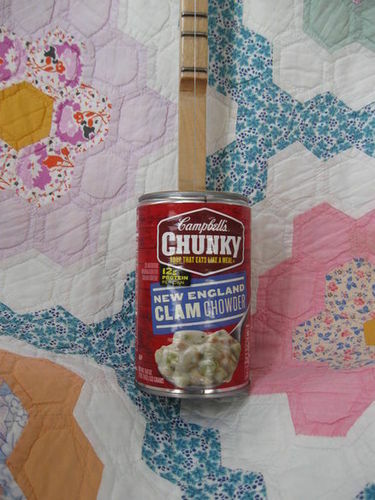 In this build I used a Campbell’s New England Chowder can. For those of you that are into stringed instruments the scale is 24 1/2” that is the distance between the bridge and the nut which in this case is a slotted pan head screw. There are twelve frets spaced similar to that of a dulcimer. The technical name is Diatonic fretting. It is Do, Re, Mi, fa, Sol. La, Ti, Do or C, D, E, F, G, A, B, C.
There is no one way to build these instruments as you will discover if you research them. This is just the way I chose to do it. The can size is up to you it is just a resonator. At first I thought you were posting an afghan Lee! LOL! But I soon realized it was not about that at all. Nice work on your Canjo… I just leaned something here…Because I never heard of a Canjo before but I have eaten a few cans of that New England Calm Chowder for sure! I’m with Tony. I thought you were starting to knit a sweater. Which would be fine right now with the cooler weather. I checked out the link. I’m going to think about this more. Nice job Lee. Now your a luthier? Do you use a slide? This is a brand-new Thing, in my experience, here on LJs. I mean, guitars aplenty. But, a canjo? I’m up a tree, right now, over this. 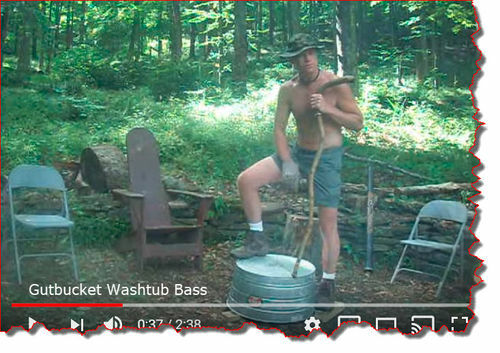 Tony: Surely, you’ve seen a bass fiddle made of a washtub turned upside-down with a broomstick attached to the tub and the top end of the stick? They’re played by accurately changing the tone, by ear, through simply moving the top of the stick around. That’s what this “canjo” reminded me of. When it comes to musical instruments I’m as green as they come! Thanks for the link Mark it was truly entertaining! Lee if you ever make a video of you playing your CanJo please share it here! Thx for extending what I will eventually forget… no truly, thx for the info. Tony, I should have chosen a better background. It’s way prettier than the project LOL!! I didn’t know what a Canjo was either until I got interested in CB Gitty’s website. He is all about “Folk Instruments” and how to build and play them. Dave, be careful you don’t get hooked on building these fun instruments :) LOL!! Ralbuck, thanks for your kind words. They are fun! Tom, definitely not a luthier, but I did make a slide out of a piece of copper tubing. Mark, these are so fun to make. Instant entertainment!! 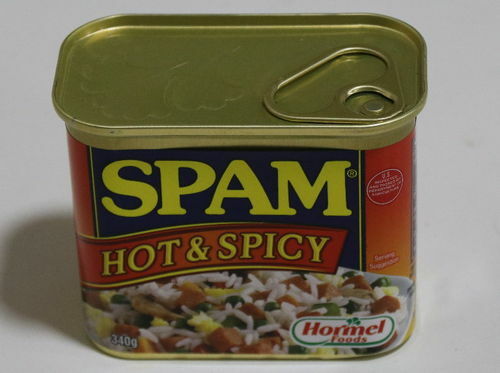 LittleBlackDuck, actually the spam cans are one of the favorite choices among Canjo builders. Thats very interesting, well done. Thanks Brian for your kind words. Cool instrument, Lee. Now we need a video of you playing dueling banjos on it! !